At Computer Surplus Outlet you can save a ton of money! Need a new system? Come by for a refurbished system, starting at just 199.99! These systems include a tower, monitor, keyboard and mouse. Supplies are limited, and this offer is only valid for a limited time. Stop by immediately to lock in these rock bottom prices! At Computer Surplus Outlet we can save you a ton of money on all computer related equipment every day. You'll find some of our best deals listed right here. 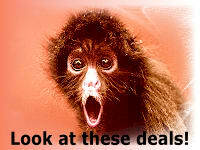 Checkout some of our currently advertised, unbelievably priced "In-Store" specials. Be sure to check back often as the items here won't last long. When there gone, they're gone. For a limited time Computer Surplus Outlet has complete computer systems on sale starting at only 99.99! This amazing deal won't last long so be sure to head down to Computer Surplus Outlet today and grab yourself one before time runs out! Computer Surplus Outlet currently has a large quantity of laptops in stock and we're offering these Off-Lease Laptops at amazing prices to clear warehouse space. These Laptops are perfect for new college students and use around the use. Come see us today to secure yours! Computer Surplus Outlet currently has an overstock of laptops. In an attempt to clear out inventory, we are selling these at $100 off! Our supplies won't last, and these deals won't either! We are currently offering a complete computer system, including software for 199.99! These systems include a tower, keyboard, mouse, and monitor, with operating system. ►Information on this page includes Computer Surplus Outlet, computers, graphic, cards, off-lease, laptops, complete, systems, supplies, prices, warehouse, specials, deals, and checkout.